Digitally remastered edition housed in a mini LP sleeve. 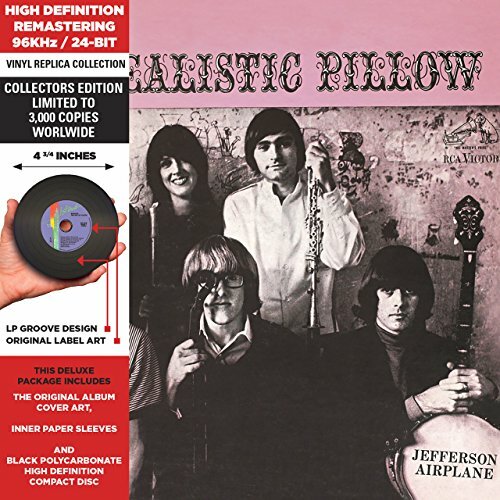 Surrealistic Pillow was the Jefferson Airplane's 1967 breakthrough album. It introduced the band's immortal hit songs "Somebody To Love" and "White Rabbit" and Jorma Kaukonen's masterpiece on solo acoustic guitar, "Embryonic Journey. Deluxe Vinyl Replicas by Culture Factory constitute high quality reissued compact-discs which reproduce all the components of the original LPs and are their exact replicas in compact-disc size (5.3 x 5.3 inches), with authentic single or gatefold cardboard jackets and paper sleeves. In addition to the above, each compact-disc Deluxe Vinyl Replica includes a black finish CD complete with the original label to give it the look and feel of the original record album. Culture Factory strives to achieve an authentic sound with the highest possible fidelity to the original studio masters. Our remastering process brings out the music's true dynamics and original clarity with low levels of noise. In the remastering studio the audio tracks are handled in the form of high-definition, 96Kz / 24-bit digital files for greatest preservation of fidelity. Signal compression is sometimes used to bring out frequencies that were absent or barely heard in the original recordings, and we use the least amount of compression possible. While sound perception varies greatly among individuals our vinyl replica CDs are designed to provide the optimal listening experience when using flat EQ settings. Brand new, original, factory-sealed, limited edition CD release.